Home / 20th Century Fox / Alexandra Daddario / Leven Rambin / Logan Lerman / movie / Percy Jackson / Percy Jackson: Sea of Monsters / Rick Riordan / Warner Bros. / Greek Gods' Teen Queens in "Percy Jackson: Sea of Monsters"
Greek Gods' Teen Queens in "Percy Jackson: Sea of Monsters"
Logan Lerman returns as the titular hero, the demigod son of Poseidon in “Percy Jackson: Sea of Monsters” who embarks on his own, modern-day Odyssey. The beginning of the second adaptation of Rick Riordan’s best selling “Percy Jackson” book series finds our hero doubting himself and not living up to his potential. Feeling abandoned by his father and finding out that he has a half-brother who is a Cyclops, Percy soon deals with an enormous task ahead along with his teen demigod friends Annabeth and Grover along with his newfound brother Tyson to save their world from extinction. Alexandra Daddario returns as Annabeth Chase, the demigod offspring of Athena, goddess of wisdom, the role she created in “Percy Jackson & The Olympians: The Lightning Thief.” One of Percy Jackson’s best friends, she took a while to warm to Percy when they first met, coming around only after he showed his mettle in a game of Capture the Flag. 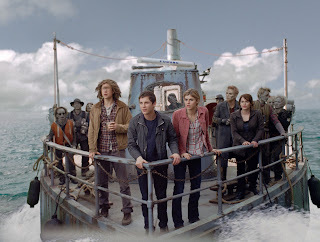 She joined Percy on his quest to find the Lightning Thief and once again to recover the Golden Fleece. “Percy Jackson: Sea of Monsters” opens this August 7 in cinemas nationwide from 20th Century Fox to be distributed by Warner Bros.